So day 1 actually started at home approx 200 miles away from Legoland. Leaving at 5:30am, with 2 stops on the way, we made it there for 10am (the opening time). So with the sun shining we strolled into the park and started talking about what our first ride would be. Initially we wanted to go on The Dragon however that land didn’t open until mid day, so we went to the nearest ride … Ninjago. Last time we were at Legoland we had to queue for about an hour (at least) for Ninjago, this time we walked straight onto the ride due to there being very few people in the park causing a lack of queues. It is worth noting that if you want to visit a park with no queues an get straight onto rides then you will want to go during the week, during term time. After going on a series of rides (Ninjago, S.Q.U.I.D Surfer, Submarine Voyage, Coast Guard HQ and Laser Raiders), we thought we were doing really well, nice sunny day, no queues etc. Heading for The Dragon as it was nearly mid day, and suddenly the heavens opened and it was hail stoning! Obviously we weren’t prepared for this sudden hit of hail, so we made the decision to go to the car to get our water-proofs and sit in the warm in hopes that the weather would change soon enough. It only took about an hour and the hail stopped, so we carried on with our day. We strolled back into the park and the sun started shining again (what is with British weather?!?!) We managed to go on every ride that we wanted to go on and some of them we did twice, before leaving the park around 3pm. In the 5 hours we spent in the park we went on 12 rides in total, had lunch at the pizza, pasta buffet and had an hour sat in the car waiting for the hail to stop. We didn’t see many people and never had a queue that was more than about 5 minutes long, so it was perfect for walking around and going on all of the rides. Day 2 was Thorpe Park day. As stated above, we managed to go on 17 rides at Thorpe Park. The park was so empty the staff were encouraging people to just stay on the rides at the beginning of the day. When the park opened no one ran to the rides (like they normally do during the summer), because there were only like 100 of us there at the start of the day. Some rides we really enjoy like; Nemesis (which we rode 3 times), Derren Browns Ghost Train (which we rode twice), The Walking Dead (which we rode twice) and Flying Fish (which we rode 4 times and went round the track 10 times in total). When I say we really enjoy, Derren Brown, well neither of us keep our eyes open! And I (Kate) am so jumpy and hate The Walking Dead ride as I jump all the time when on it (made on edge by the fact they sometimes have actors in the walk way leading up to the ride). I have always wanted to go on Saw the ride but didn’t want to go on it on my own, nor did I really want to have to queue for it. What better time than a day with no queues at all? So together we went on it. Now, I like rollercoasters and don’t really ever hold on but Saw the ride was horrible! I’m sure at one point I screamed “F**K THIS! !” and grabbed on to my restraints. It is not a ride I will be rushing to get back on, it made me feel really sick. Again we were finished in the park about 3pm, and due to no queues we did everything we wanted to do and more. However since we had been on 17 rides, primarily big rollercoasters, my body was rocking when I lay down and shut my eyes. So yeah getting on rides without a wait is great, but it stops you from being able to sleep properly! Finally, we went to Chessington World of Adventures! Now we didn’t time this day as well as the last two. A lot of schools broke up a day early for the Easter holidays, which meant more people and a few queues at the park today. Nevertheless this didn’t stop us from getting on 15 rides. We went onto Dragons Fury first, which we always do as it gets busy quick. This is very similar to Spinball Wizzer in Alton Towers, but Dragons Fury doesn’t make me want to be sick – which is alway a good thing. This along with; Rattlesnake, Scorpion Express, Vampire, Zufari and Tiger Rock are our favourite rides in the park. There are others that we like to go on however these are our personal favourites. Just a note but you don’t really get wet on Tiger Rock (Log Flume). We love Chessington World of Adventures because they (normally) sell Icee’s and are the only place in the UK that do. But they do NOT sell Icee’s in April… This is apparently because it is too cold, yet they sell ice-cream and slushes in April? After not being happy, Chessington gave us free Unicorn Star Slushes, which was a kind gesture. However you must know that a slush is NOT an Icee and is not even close to being an Icee. So this means that we will have to return so that we can get an Icee fix, possibly in June. 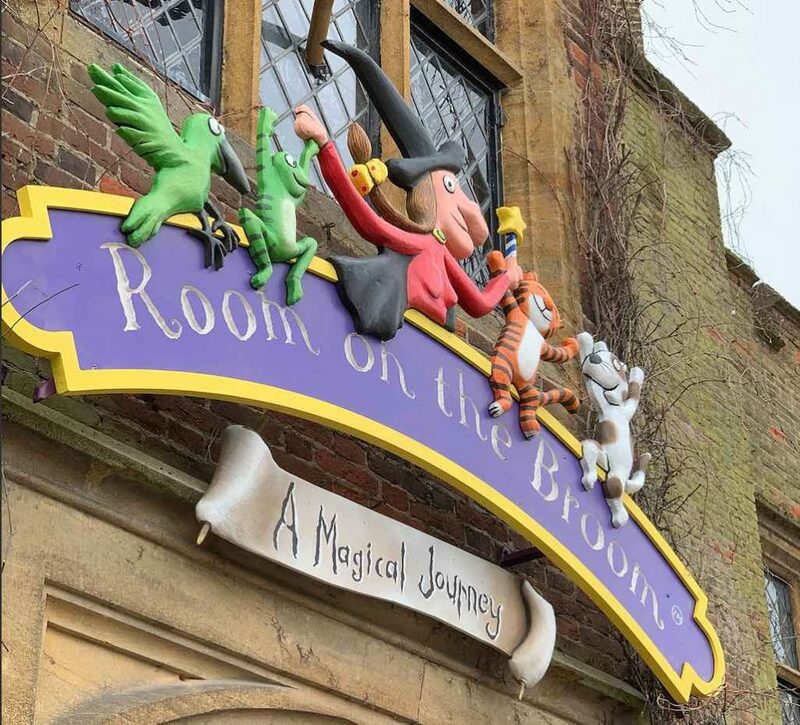 New ride Room on the Broom at Chessington World of Adventures. We had a lot of fun over the three days, getting on lots of rides and having lots of laughs! It is theme park season again and we have done all the Marlin parks within a month of them opening again… Yay! Previous Previous post: Gandeys Circus 2019 – The Greatest Show.